If there's one thing my kids love, it's Teriyaki Chicken. And if there's one thing I love it's having dinner miraculously cooked for you all day in the slow cooker. And so the two combined to produce this. I got the idea from the Lake Lure Cottage Kitchen blog; I just tweaked quantities a little bit and used mirin, taking out the cider vinegar in the original recipe. It was a real hit and I loved that all I needed to do when everyone was hungry was just put some rice on to cook and chop a spring onion. I love to eat the chicken shredded on fragrant Jasmine rice with some of the sauce poured over and topped with a crunchy, chopped raw spring onion, or some soya beans. Because of the long cooking, I wouldn't recommend using chicken breast - you'll find the chicken thighs stay tender and juicy after cooking. Oh, and I did try making this without the sugar - and it just wasn't the same. You need it, not only for it's soft sweetness, but it gives a rich consistency to the sauce, too. 1. Heat the slow cooker to high and lay the chicken thighs in the bottom of the crockpot. Replace the lid. Next, combine the sugar, soy, mirin, ginger and garlic in a bowl or a jug and pour this over the chicken. Put the lid on and cook for about 3 hours, until the chicken is tender. 2. Transfer the chicken to a plate and keep warm (a loose covering of foil should do the trick). Pour the dark sauce into a saucepan and heat, stirring until just boiling. Mix the cornflour and cold water together and pour into the sauce, stirring, to thicken. 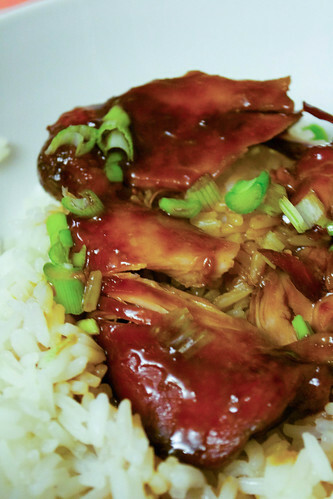 Serve the chicken on some rice with the chicken flaked over and a little of the sweet, sticky sauce drizzled over the top. If you have any leftovers, these are great made into a sandwich with a little chopped spring onion, or flaked, in large chunks, into an aromatic Chinese-style soup.